Water meters are the most effective way to monitor water use. They can detect small leaks and losses and are an effective way to track seasonal and annual consumption. A basic water meter (costing about $350) will help detect where water can be saved and identify water efficiency options on-farm. They are a valuable feature of any farm striving for sustainable water use. An alert system can tell you if water is flowing when it shouldn’t be, allowing quick detection of leaks and speedy repairs. Assign a specific person to monitor the alert devices. An alert system can be set up using the following methods. A pressure gauge on a line feeding water to the farm registering lower than normal is a likely sign water is being lost somewhere in the system. If a storage tank and pump provide water down the farm, a pilot light on the pump can serve as a visual alert that the pump is on. If the pump is running when it shouldn’t its likely there is a leak and you should look for the cause. A standard spotlight works, but an LED type - visible from a distance and even in daylight - is worth the small extra cost. The ‘click, click’ sound of an in-line dispensing system can alert you that water is running. Unexpected fluctuations or records that never return to zero on meter readings may also indicate leaks. The right number and placement of isolation valves can ease the task of finding and fixing leaks and shutting off water in an area to assist repair. They can also be used to turn off water to areas not always in use such as the calf shed. Mark isolation valves on your farm map so they can be found if the system needs to be modified. Place the water meter it in a spot that is convenient to read or attach a data logger, or telemetry unit, which will send the data straight to a computer system. Consider how the meter’s location will affect the data collected. For example, if you install a meter on the line of a slow filling tank that gravity feeds it will constantly show low values and leaks will be hard to detect. If you put the meter (with telemetry) on the outlet of the water tank it will be more sensitive to changes in flow. Low leaks can then be detected when flow is seen outside normal animal drinking hours. Read meters at the same time and day on a regular schedule to ensure readings are consistent. Readings can be recorded on DairyNZ's Tracking Water Use form. At least once a month, read the meter late in the evening and again early the next morning, to check for small or unnoticed leaks. Assigning meter-reading responsibility to one person makes it part of a routine and reduces the chance of it being forgotten. Record meter readings regularly to track seasonal and yearly farm water use. The industry estimates that typical water use for milking cows is about 140 litres/day (70L for drinking and 70L in the farm dairy). Weather conditions and feed will affect stock water intake. If overall water use on the farm regularly exceeds 140L/day, it’s worth having a closer look for possible water losses or inefficiencies in operation. Installing a water meter allows you to record actual water use and identify areas where water can be used more efficiently. 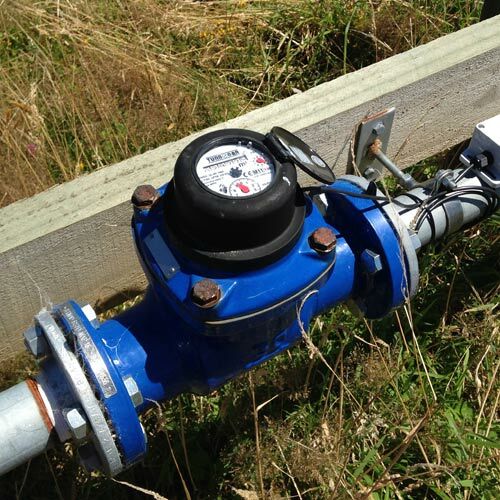 Irrigation New Zealand's Water Measurement 'Blue Tick' accredited operators are recommended for installation of water meters and can provide advice on the most suitable option. For a list of accredited companies, click here. Ask the following questions when you are deciding on what type of flow meter to choose for a particular job: The following questions can help you decide which water meter is best suited to your farm. Is there anything in your water that may affect the meter? High silt loads, weed issues, sand, pumice, iron or manganese in source water can all affect the performance of a meter. Mechanical flow meters will wear out faster in silty or gritty conditions. How much do you want to spend on a water meter? Generally the more accurate and reliable a meter, the more expensive it is and more expensive meters tend to have a longer lifespan. Purchase price is not the only cost to consider. When installing a water meter, there may have to be adjustments to the pump setup, pipe work or fittings so that the meter specifications are met; using a Blue Tick accredited installer will ensure this happens. How accurate are water meters? If you require a specific level of data accuracy, then selecting a meter that has the manufacturers stated and tested standards is important. Ensure the meter has a maximum accuracy of five percent. This means that readings are considered to be within plus or minus five percent of the actual flow. A meter will only be accurate if the manufacturer’s specifications are met, including flow profile, temperature, humidity, flow range and vibration. Most importantly it must be installed according to the guidelines. What level of data output is needed? If consent conditions need to be met, ensure the meter is capable of meeting them. Consider what data units are needed and whether an instant flow (the actual flow at a specific time), total flow (the flow over a period of time) or both is needed. Data can either be read from the meter by a person manually (which requires time and commitment) or collected using information technology devices (data loggers or telemetry). Consider long term options that will collect regular and timely information. How much flow and head do you have? It is recommended to use a Blue Tick advisor to install your meter to ensure it matches the head and flow at your site. Most meters need a minimum head and flow to work, which will be outlined in the manufacturer’s instructions. Some meters can also reduce head. Talk with your Blue Tick adviser if this is important to you. They will be able to suggest measures you could put in place to correct head or flow loss such as repositioning your meter. Large meters may lose accuracy at the lower end of your flow range. Meters that are constantly operating in their high flow range wear out and fail quicker than meters that operate in the middle of their flow range. There are two main types of water meter available to monitor shed water use; mechanical and electromagnetic. The cost and accuracy varies between these meters. In general mechanical water meters are the cheapest up front however need earlier replacement and have poorer accuracy than the electromagnetic.. Most mechanical meters have an impeller that is rotated by water passing through the meter. The amount of turns is translated to a volumetric reading. The meters are available in various sizes and they, and the pipes either side of them, have to be full of water during measuring to ensure they are accurate. Reliable and accurate measurement providing the meter is correctly installed. In-line maintenance with simple efficient mechanism. Replacement for parts (e.g impellers) readily available. Difficult to detect malfunction or human interference to meter while operating if operated with a data-logger. Prone to wear in silty water, potentially resulting in loss of accuracy. An electromagnetic meter consists of a section of pipe with a magnetic field around it and electrodes which determine flow based on how the electrical voltage is changed by the water flow. This type of meter is produced in a range of standard sizes and flow capacities. High degree of accuracy (+/- 0.15-2%) and consistent over full flow range. Wide flow range and no obstructions to flow. Robust with minimal routine maintenance required. Electronic components vulnerable to lightning damage. Water Measurement ‘Blue Tick’ accredited operators are recommended for the installation of water meters and may be required by your regional council. 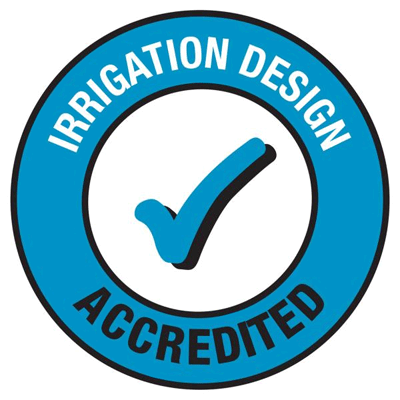 For a list of accredited companies visit the irrigation accreditation website irrigationaccreditation.co.nz. before any outlets so that the entire water output is measured. Most meters need to be fitted in a long straight length of pipe. Meters will not record the water flow accurately if flow is affected by turbulence or backwash caused by bends or junctions. The length of straight pipe before the meter should be 10 times the pipe diameter. The length of straight pipe after the meter should be five times the pipe diameter (see diagram below). Not all meters require this straight length of pipe to function, check the manufacturer’s specifications of the meter. Check with your regional council or meter supplier if you have any questions about which meter to choose and how to correctly install it. Choose a 'Blue Tick' accredited operator for installation work or advice on water meter options. View accredited companies here. Use this form to record regular readings (weekly, monthly etc) from your water meters. In the absence of meters, you can use this form to record all your water uses, then do the calculation to estimate total consumption.